The popularity of escape rooms shows no sign of slowing down. If you have never done an escape room, it is a themed scenario in which you and a few people are locked in a room and are working together to escape by finding clues and solving puzzles. The Unlock! Escape Adventures emulate this escape room phenomenon by creating scenarios which you can experience in the comfort of your home. Unlock! 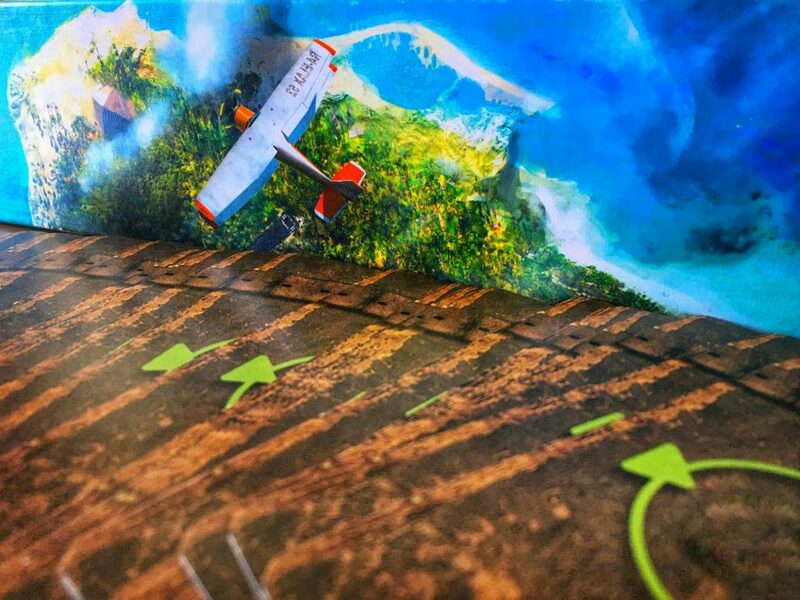 Escape Adventures consists of the first 3 scenarios (The Formula, Squeek and Sausage, and The Island of Doctor Goorse) in this series of escape room games. Each scenario has its own unique setting and plays independently from the others in the series. 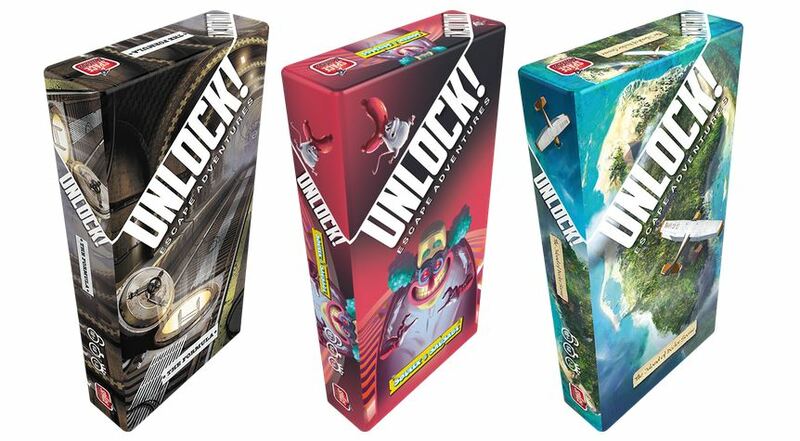 In Unlock!, one to six players will work cooperatively to search areas for objects, clues, and hidden information, manipulate machines, and solve riddles and puzzles. Players will attempt to complete their mission in 60 minutes to try to get the highest star rating. The entire Unlock! system relies on two main components: a deck of cards and a free app. Since the game is a puzzle for players to solve, each scenario can generally only be played once. However, with enough time between plays, it is possible to forget details and still experience a challenging scenario again. Each Unlock! scenario comes with a deck of 60 cards whose backs will have a number or a letter. The other side of the card, which players should not look at unless instructed to do so, will have either an Object, a Machine, a Location, or a Penalty for an incorrect answer. The color of the header on the card helps players determine the type and use of a card. Cards with a red or blue header and a puzzle piece icon are Objects which will often interact with other cards during the game. Cards with a gray header could be a Location or room where other cards can be found, a Penalty card, the result of Object cards interacting, or a card providing clues for a puzzle. The green header on a card indicates that this is a Machine and must be manipulated by players to provide additional cards. All yellow header cards with a lock icon require a 4-digit code to be entered in the app before progressing through the story. The different card types used in Unlock! The other essential component in the game is the downloadable app. It serves as the timer for the mission, provides hints when requested, and logs those hints for reference during the game. It also has a penalty button which subtracts time when an answer is incorrect, has machines that need to be manipulated in the app during the game, and it is also where the 4-digit codes are inputted. Once a correct code is validated, players will be given new information and cards to progress through the scenario. In addition, there are options to play thematic music for each scenario and enable the app to automatically provide hints for the hidden objects. App screenshots from The Formula scenario. Each Unlock! scenario includes a 10 minute, 10 card tutorial to help players familiarize themselves with the system without having to read the rulebook. The story and puzzles in the included tutorial are the same for each scenario. 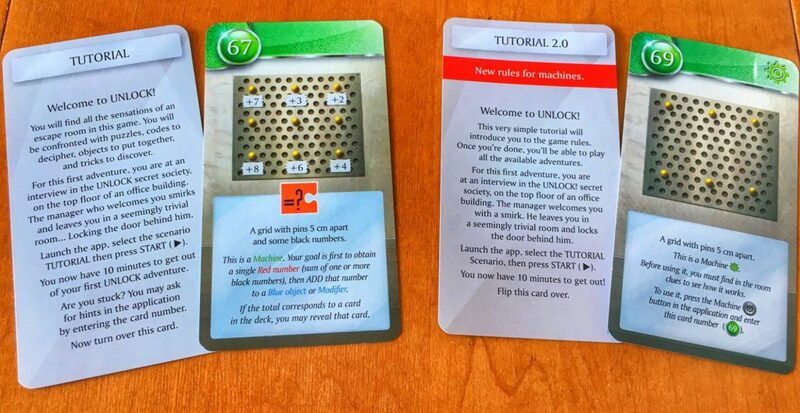 However, depending on the tutorial version, the rules for Machine (green) cards may be different. The three scenarios that make up Unlock! Escape Adventures were developed so that players manually use the machines by manipulating the numbers indicated on the Machine card. Both the rulebook and the first version of the tutorial explain this in more detail. The subsequent scenarios in the Unlock! series (Mystery and Secret Adventures), use machines in a different way. The new rules for Machine cards are explained in the Tutorial 2.0 and require players to use the machine in the app instead. Both versions of the tutorial. Note the differences in how the green Machine cards are used in each. The gameplay of a scenario is quite simple; place the deck of cards facedown on the table, launch the app, read the story or mission on the first card, and then start the app’s timer. Whenever players notice a number or letter on a card, they may search the facedown deck and reveal the corresponding card. Often these numbers and letters are presented in a gray circle, but sometimes they are hidden. 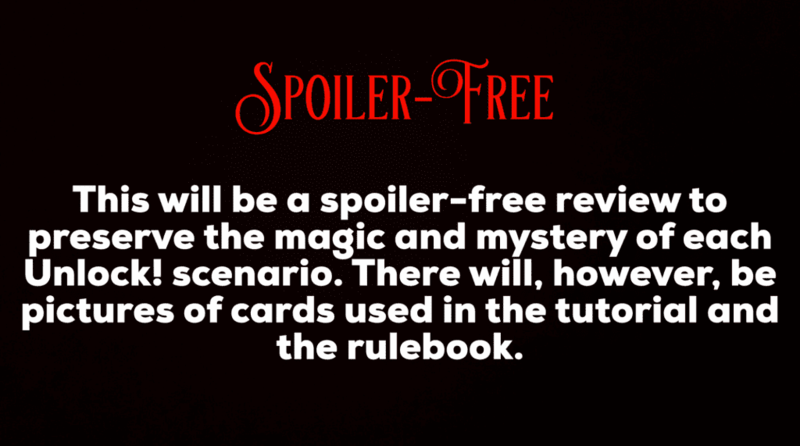 The revealed cards remain faceup on the table until players are instructed, by a card or the app, to discard them. The game will end once players have completed the mission. While it is best for a group’s score to do this in the allocated time, it is still possible to continue to play the scenario once the timer runs out. Blasted Professor Noside! Once again, your old enemy has stirred up an evil plan, but you have courageously slipped into his headquarters to prevent it. Difficulty Level: 2 out of 3. Significant Changes: This scenario follows the standard rules of the Unlock! system. This scenario is a good introduction to the Unlock! escape room system because players’ decisions are more guided by the game than in the other two scenarios. That said, if you are unfamiliar with Unlock!, I would recommend turning on the automatic help for hidden objects in the app because this scenario has a lot of hidden information and it is not always easy to know when you are missing clues to solve a puzzle. The machines work well in the app, even though they were originally designed to just be manipulated with the cards. The story is also strong in this adventure, except for one puzzle that felt like it was added to the game for its wow factor and not because it enhanced the gameplay. 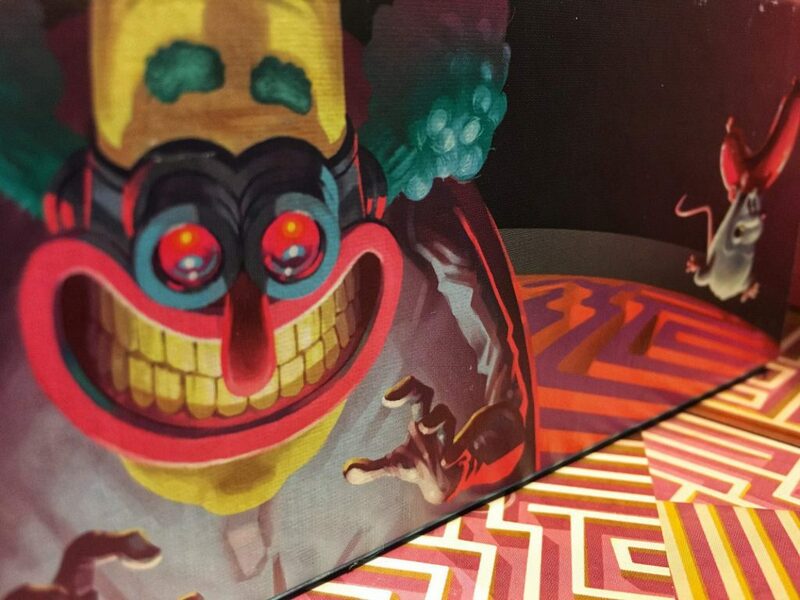 There is also another puzzle towards the end of the scenario that felt obtuse. Otherwise, this is the ideal scenario for players to first dive into the Unlock! system. Significant Changes: This scenario follows the standard rules of the Unlock! system. However, players are not given the option to turn off the automatic help for hidden objects in the app. Of the three scenarios, this one was my favorite because I liked the complexity of the puzzles and how they worked with the theme. This scenario’s focus was on logic puzzles instead of puzzles with real-world solutions. While the puzzles were incredibly clever and unique, the adventure felt more linear than the others. Players will often work together on one puzzle at a time which means that with a larger group, some players may not feel like they are contributing. The machines were also quite difficult to manipulate in the app and I would recommend using the original machine rules in the first version of the tutorial for this scenario. Difficulty Level: 3 out of 3. Significant Changes: The player count for this scenario is changed to 2 to 6 players from 1 to 6. There is also a significant rule change introduced at the beginning of the scenario that affects communication. This scenario requires more players than I would normally recommend to play any Unlock! game because, when playing with a small group, this scenario can be quite frustrating and difficult. In large part, this is because of the new communication rule. This rule change is innovative and very thematic, but it requires each player to be on their best game. The story is also well implemented and the theme is strong overall. However, a number of puzzles felt like they did not fit and actually detracted from the thematic gameplay experience which is why I felt the most disappointed with this scenario. 6 Tips to Get the Most Out of Unlock! Read everything carefully and examine the cards thoroughly because sometimes the small, subtle details will strongly impact your game. Assume everything is significant. If something seems odd or out of place, it is likely a clue to help solve a puzzle. Occasionally there are red herrings, but more often than not, it will be useful information. Be patient. The game usually introduces objects and clues for a puzzle at different times in the scenario and it takes patience to know when the right time to use them will be. Read the rulebook at least once after you have completed the tutorial. Take hints if you need them and don’t worry too much about how it will affect your final score. It is better to take a hint than waste time stuck on a puzzle for which you may not have all the pieces. Work cooperatively and communicate well. Escape rooms are great; I love the idea of being trapped in a room and trying to escape using clues to solve puzzles, all while being under a tight time constraint. The three scenarios in the Unlock! Escape Adventures do an excellent job capturing the tension (and sometimes frustration) of an actual escape room. The card and app system work well together to create a rich, thematic experience for the players that can later be given to another game group since no components are destroyed during gameplay. The puzzles are well-crafted and do not reward a single way of thinking. In spite of this, my biggest complaint about the system concerns the red and blue Object cards and the ambiguous language describing how to use them. Each rulebook and tutorial discusses combining red and blue cards by adding the number of a red Object card to the number of a blue Object card. The sum of these two cards will give players a new number for them to search for in the deck. The golden rule then states that only a red number and a blue number can be combined and that no other combination is valid. However, players are often required to use a red card or a blue card to solve puzzles on gray and yellow cards. The numbers of the red and gray cards, for example, are not being added together to find a new number, but they are being used in combination with one another to find a solution. The use of the word combine to mean the addition of two numbers feels misleading, particularly when neither the rulebook nor the tutorial suggest any other way for these red and blue cards to be used. Initially I thought the word choice was the result of a translation error from the original French rulebook, but I have since confirmed this is not the case. Nonetheless, the Unlock! scenarios are cleverly designed and I have to commend their innovative implementation of a reusable escape room system. Last year, another three scenarios were added to the Unlock! series of games as the Mystery Adventures and, this past spring, three more as part of the Secret Adventures. I expect these scenarios are just as challenging, immersive, and fun as these first three scenarios. I look forward to playing them and hopefully achieving a better star rating now that I am more familiar with the Unlock! system. Previous postVisitor in Blackwood Grove Review – Aliens, Agents, and Kids, Oh My!